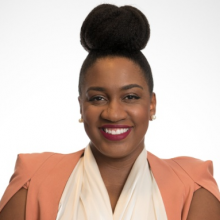 Christin “Cici” Battle is the director of People For the American Way Foundation’s Young People For, the organization’s national leadership development organization for college-aged folks. Hailing from Miami, Florida by way of Denver Colorado, Battle is a youth engagement expert that has developed and directed youth programs in local, state and international spaces. Battle is the first director of Young People For that has also previously participated in the Young People For fellowship program. Most recently, Battle served as a professor of leadership development at SENA in Cali, Colombia where she created and implemented the colleges’ first leadership development curriculum. She also created the Florida Youth Commission—the youth lead body that advises the governors cabinet on all youth related issues. She earned her bachelor’s degree in psychology with a certificate in leadership development and a master’s degree in higher education policy. In 2014, she was awarded the Florida Gubernatorial Program Public Service award and is a proud member of Delta Sigma Theta Sorority Inc.